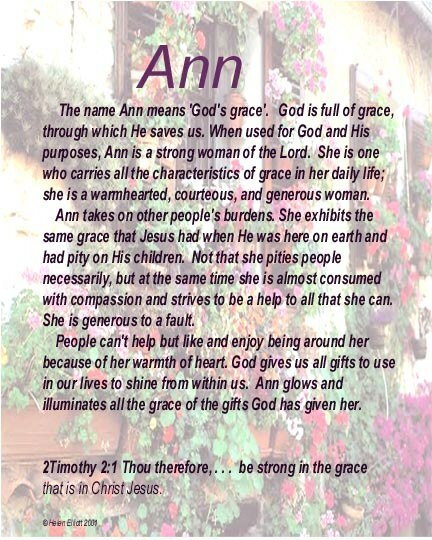 The meaning of my name 'Ann/e' !!!! French, English and German form of HANNAH. This is the name traditionally assigned to the mother of the Virgin Mary, though she is not mentioned in the Bible. The name was borne by a 17th-century English queen and also by the second wife of Henry VIII, Anne Boleyn (the mother of the future queen Elizabeth I), who was eventually beheaded in the Tower of London. This is also the name of the heroine in 'Anne of Green Gables' by Canadian author L. M. Montgomery. 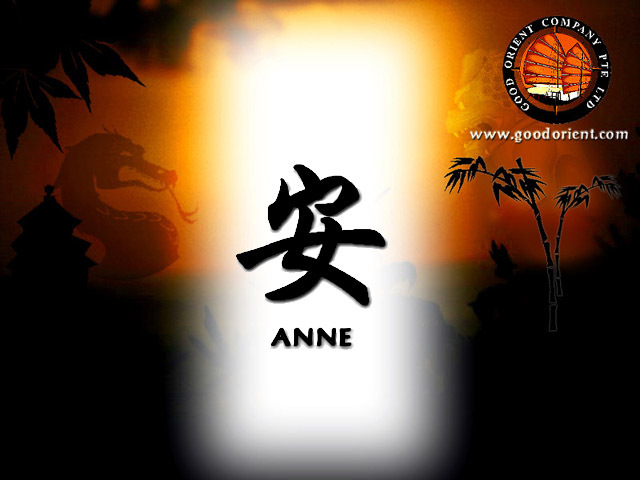 Some history behind the name Anne.. These are also a list of other names that come under the same meaning which is Anne, Anita, Anna, Annabella, Annette, Hannah, Nan, Nancy, Nanette the meaning is 'GRACE'. 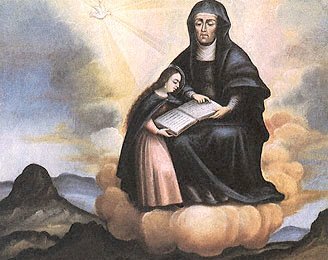 Saint Ann was the mother of Mary and the grandmother of Jesus. saint Anne Line converted to Catholicism at a time when people were arrested for this. She fearlessly helped others survive the persecutions, and her home became a rallying point for Catholics. Fully aware of the possible cost to her life, she had a priest and held Mass in her home, but was arrested and hung for it .